Because we didn’t go camping yesterday, it’s turning into a bit of a lazy weekend. Brownie points earned yesterday being put to good use today so I am off to take some pictures this afternoon. Not sure where but locally as we have an invitation out for tonight. Looks like we made the right decision anyway; awoke to the sound of rain this morning and it is very windy. I’m definitely a fair-weather camper, too many wet Glastonbury’s have tainted my outlook. This is an old image that I decided to have a little play with. 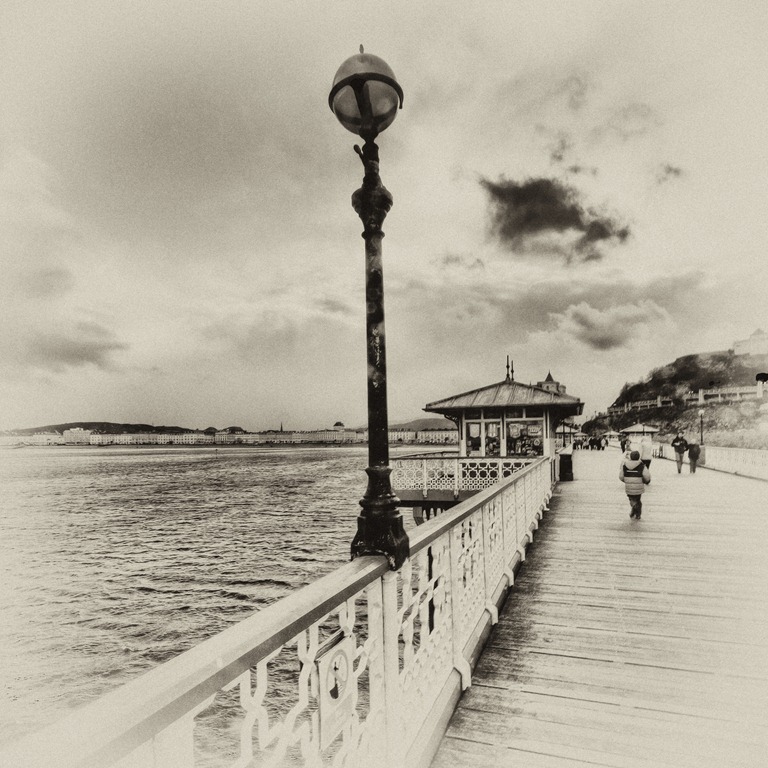 Its the pier at Llandudno and the nearest figure is my son stropping off somewhere. 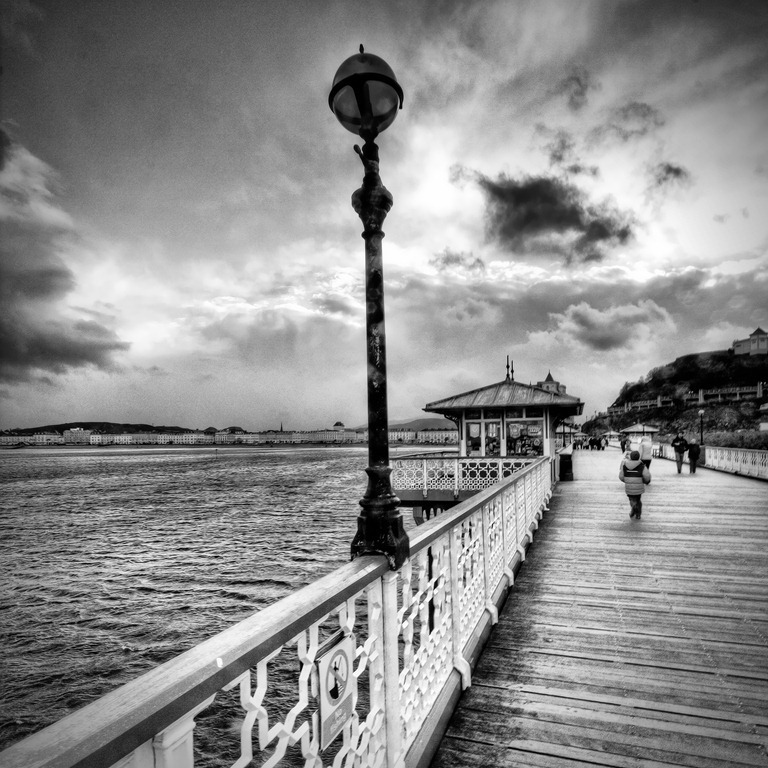 I have cropped it to square and decided to go with black and white to get the best out of the winter sea and sky. 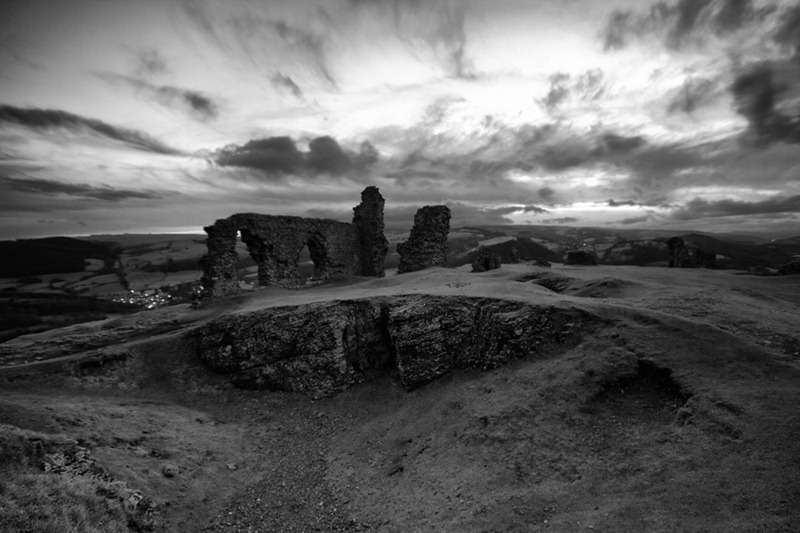 As I have said before I have 1000s of photographs backed-up that I am slowly revisiting as my processing skills improve. With many of them it is genuinely surprising what can be rescued and I am daunted by the fact that I am only scratching the surface in terms of what can be achieved with a little knowledge and a lot of practice. I have also attempted a version of this with an old-fashioned sepia tint and vignette – what my wife calls ‘The Bagpuss Effect’, for obvious reasons (at least obvious to those of you that are as old as me). This was just for fun really but I think that this sort of treatment works well for Victorian settings. Perhaps I should remove the boy in the puffa jacket for ultimate authenticity but you get the idea. Being British, as I am, I have a bit of an obsession about the weather. We all do. Mainly because it’s so unpredictable. Just as you think that Spring has finally arrived it then leaves again as if it has remembered that it has left the oven on at home. Regular Glastonbury goers will discuss the weather for months in advance; it has become a communal experience. 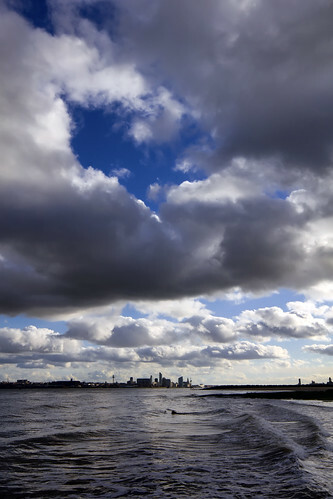 Weather prediction websites are pored over, even though there is nothing we can do about it. A wet Glastonbury can be hellish – think the Somme with vegetarian food – whereas a hot Glastonbury also has its problems, namely peeling skin and sun stroke. Weather plays a big part in the life of this sceptered isle I call home. It has to be said though that certain parts of the country are hardier than the rest of us. This picture was taken on Bamburgh beach in Northumberland. Last August. Yep, that’s British summertime distilled right there. Sitting on the horizon you can just about make out Holy Island. But wait, what’s that over to the left. Could it be that two people are actually making their way into the sea? One with a body board. When I was working on this image my wife suggested getting rid of the people to provide a straightforward seascape with foaming waves and angry clouds but I felt it better to leave them in. They add scale and context. 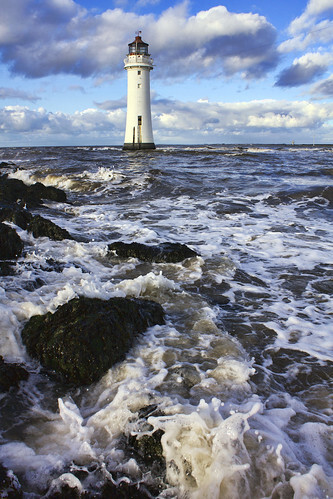 They deserve praise and recognition for venturing into the North Sea under that sky. Despite it being August, I myself was wearing wellington boots, a fleece and a waterproof jacket. The thought of swimming never crossed my mind. But then I am not from the North East but the North West and it has to be said that they are hewn from sterner stuff. Maybe it’s conditioning? 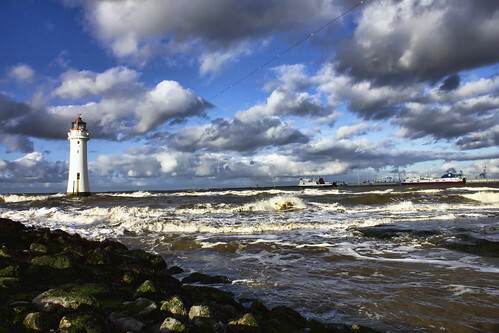 If you are forced into the North Sea enough as a child on regular occasions perhaps your resilience builds up; much like Grigori Rasputin made himself immune to arsenic poisoning by taking small doses himself at regular intervals so it is with the North Sea. Anyway, I think they deserved to be left in the picture. And why am I banging on about the weather? Because today’s planned portrait shoot today starring yours truly was postponed due to the rain. It rained all morning. To be fair, this afternoon was brighter but by then the decision had been made to cancel. It’s going to be re-arranged for March, when hopefully Spring will have remembered to come back, and remembered to lock the door behind it. 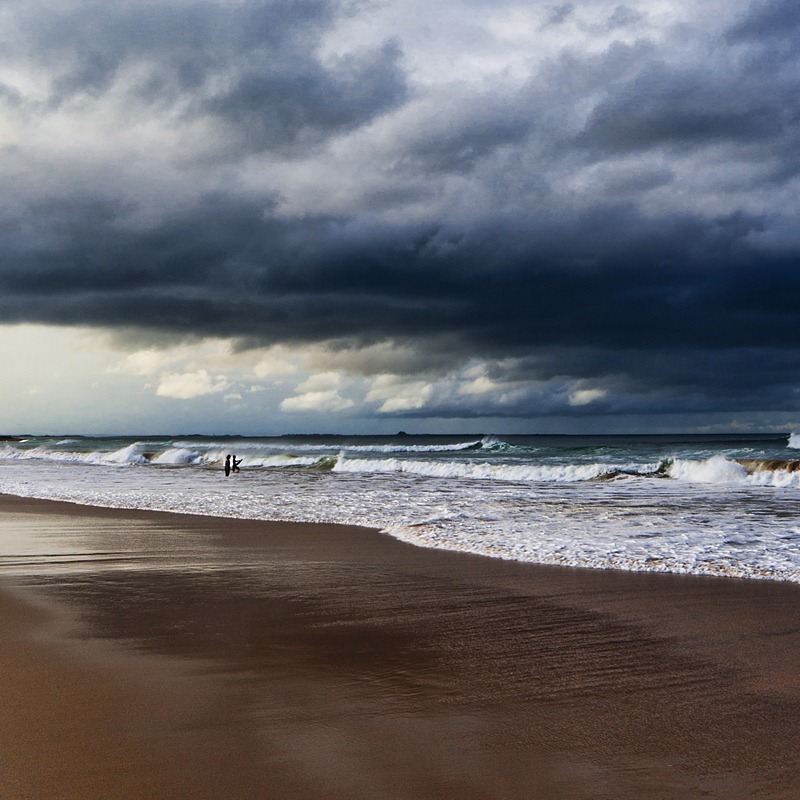 This photo was originally a 12 x 8 standard size with much more beach and cloud. On cropping to a square though I felt that it got a little bit more claustrophobic which is what I was after. It’s another one of those pictures that I had forgotten about, so its nice to do something with it. The sea is lovely and green but its the angry clouds that make it. Believe it or not it rained soon after. Who’d have thought it? Another week of blogging ends and I can’t quite believe that I am past the half way point of February already. It seems that I may well be getting the hang of this blogging lark. There’s still a long way to go (and I have the potential hurdles of Glastonbury and family summer holiday to navigate yet) but I am feeling more confident now than when I first decided on the lunacy of posting to the blog every day. The rewards though are becoming obvious and I am not talking about increased blog traffic and more comments (although both of these are true). The best thing that I am getting out of this is that it is forcing me to take photographs and to think on my feet; and what’s more to take different photographs and experiment a bit. Last Saturday’s trip out has yielded some good material and I had some particularly good feedback on yesterday’s post. 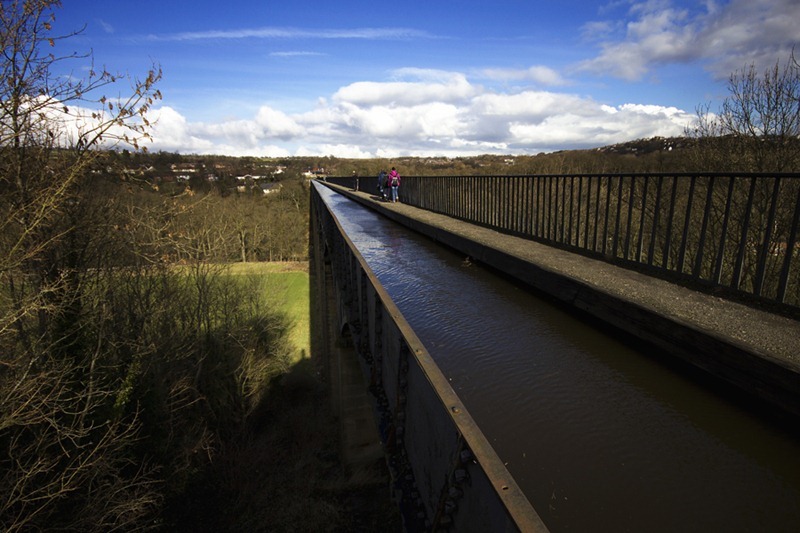 The feat of engineering here though is not this blog (although it sometimes feels that way) but Pontcysyllte aqueduct. 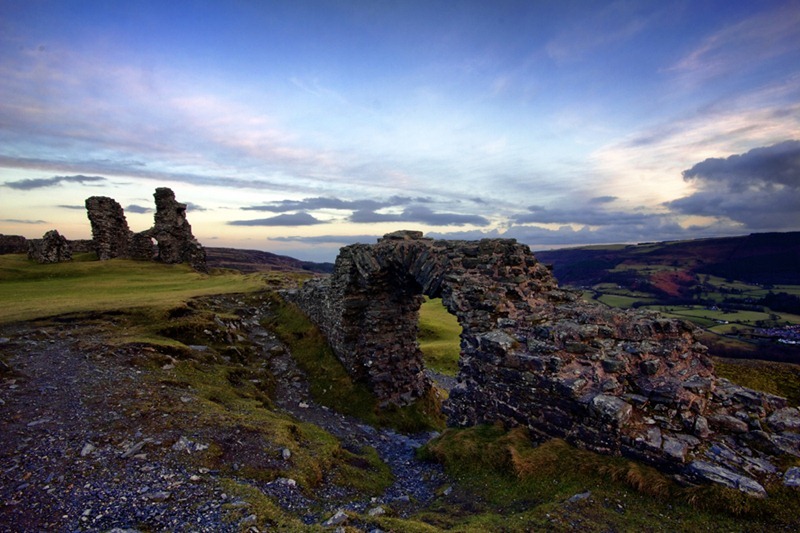 More than 200 years old it towers above the River Dee near Llangollen at a height of 125 feet above the river. William Jessop was the chief engineer responsible but it is his supervising engineer that has gone down in history, one Thomas Telford. 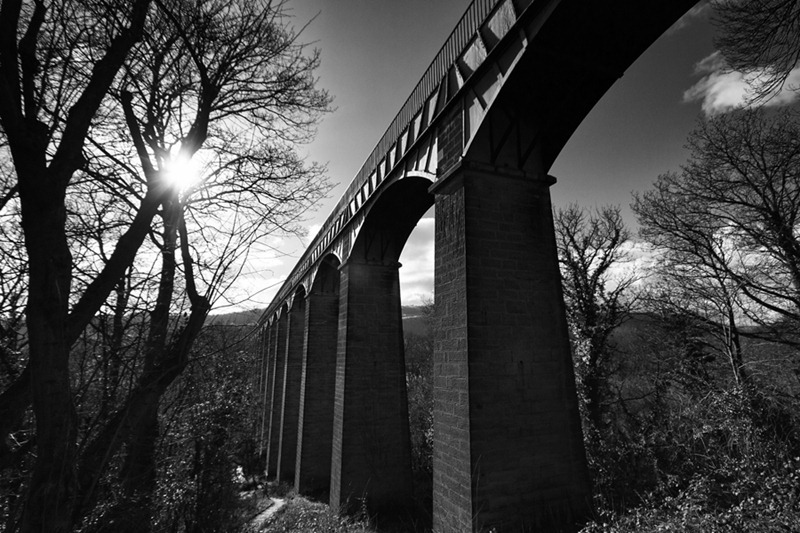 It was Telford that decided to build the aqueduct out of cast iron. 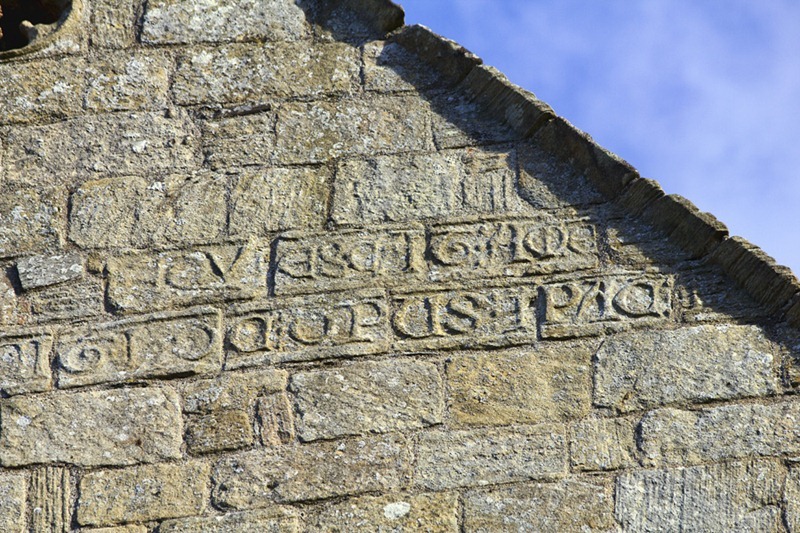 The structure was officially opened in November 1805. A band played Rule Brittania and approximately 8,000 people were at the grand opening ceremony. 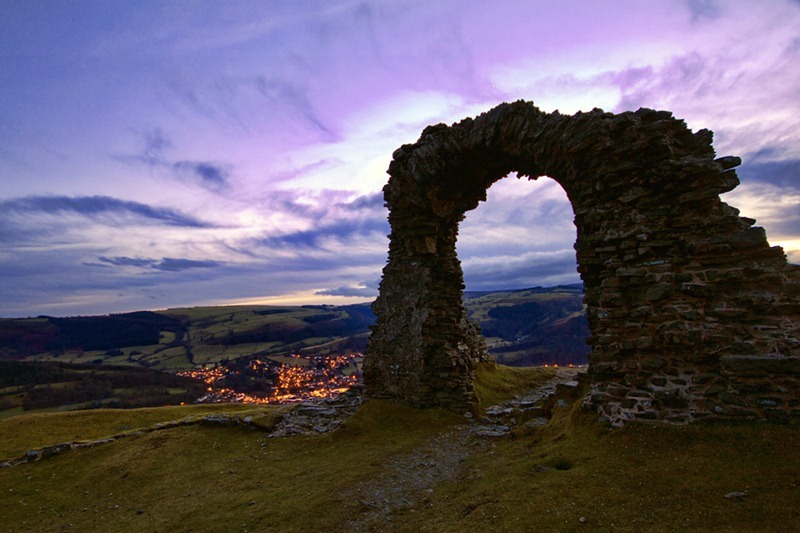 Among the first to cross the aqueduct were The Earl and Countess of Bridgwater; they led a procession of boats which traversed the aqueduct and , appropriately for North Wales, returned with coal from the local pits. 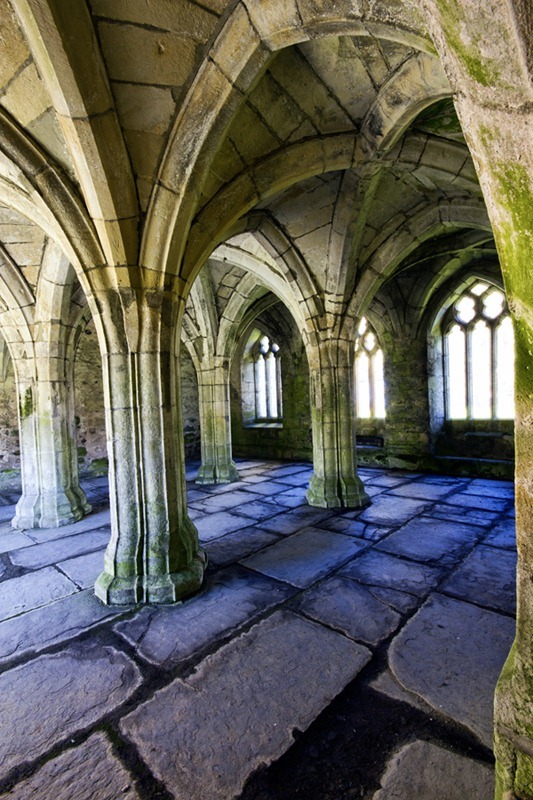 I am hoping that my pictures are giving an impression of what a grand structure it is. It’s still popular today both with canal boats and walkers/cyclists although walking across it is not recommended for anyone that does not have a good head for heights. Although the walkway side has a cast iron hand rail, the canal side has nothing – just a steep drop into the churning river Dee below. I’m not too bad with heights but certainly think that if I were to cross on a canal boat I would probably stay inside or get out and walk. In stark contrast with Valle Crucis abbey (which is less than 5 miles away) this is an entirely modern structure, despite its age, and no less impressive. 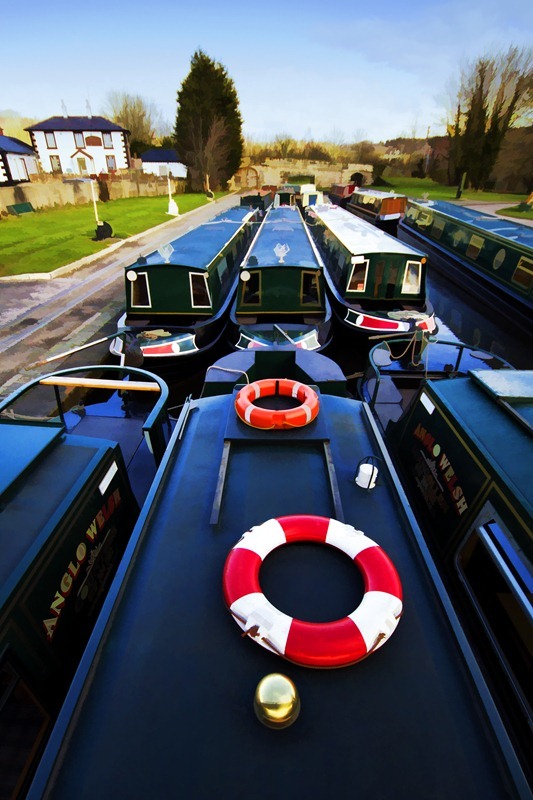 More than 10,000 boats cross the aqueduct every year and it is under consideration for world heritage status. Also, the views from the top are pretty spectacular, as are the views from below. 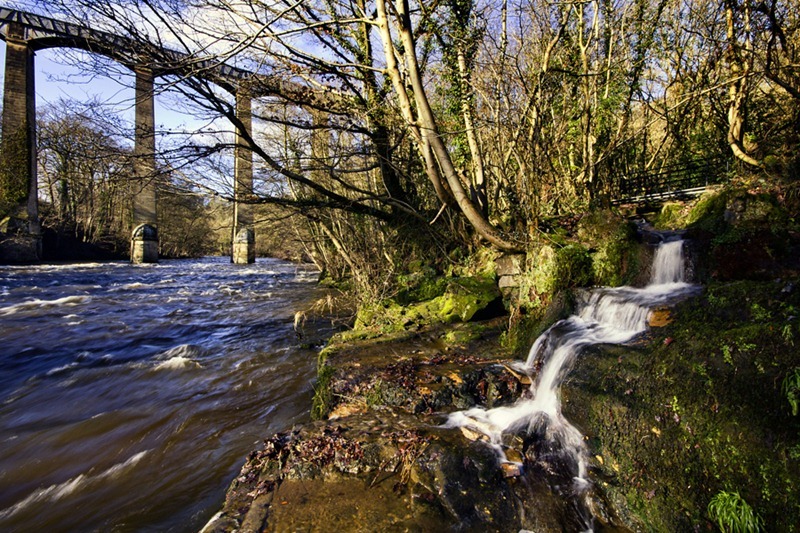 Debate still rages over who was primarily responsible for the Pontcysyllte aqueduct. Telford took all the glory and it is his name that adorns the plaque at the canal side; Jessop did not even attend the opening ceremony but apparently was a more modest individual without Telford’s gift for self promotion. Jessop was certainly better known canal engineer though, with Telford best known for roads and bridges. Either way, its a masterpiece of 18th century industrial engineering. Let’s put it down to a joint effort. So says Tom Cullen (a lot) in Stephen King’s post-apocalyptic masterpiece ‘The Stand’. 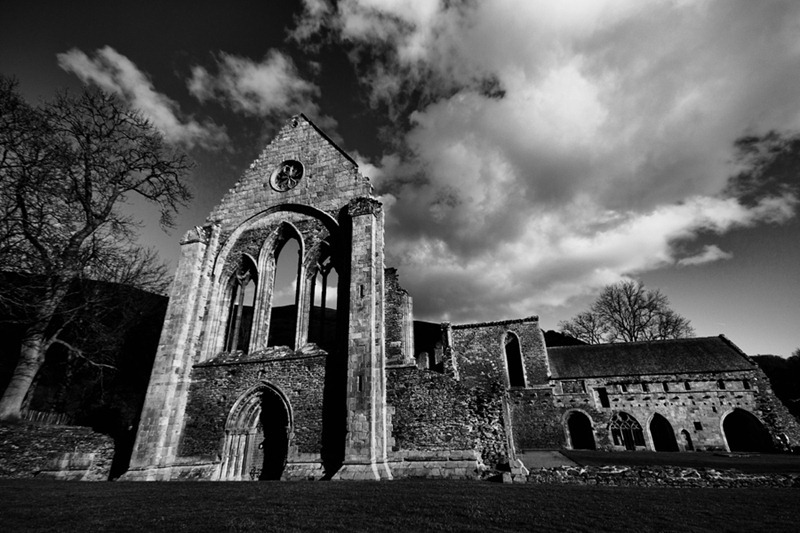 There’s nothing post-apocalyptic here but, as remarked on earlier in the week, when was taking photographs of Valle Crucis abbey I suddenly became aware of the moon being very visible in the daytime sky. 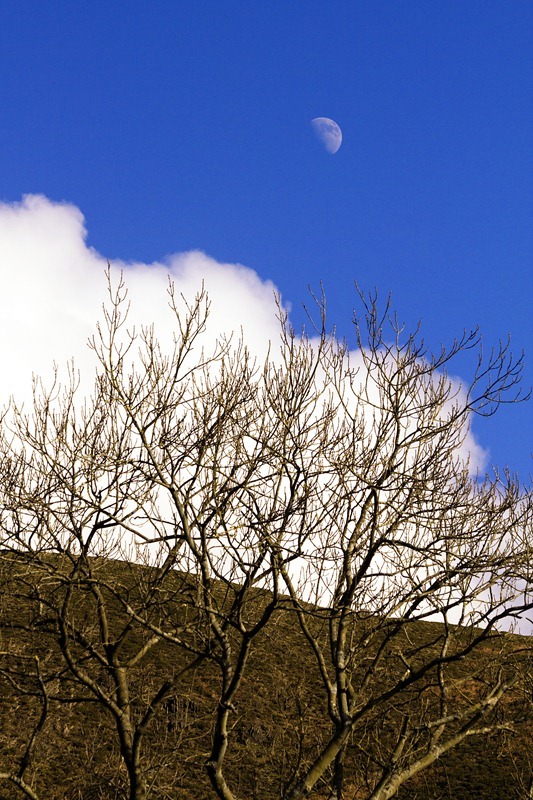 There have been occasions in the past – few and far between – when I have been aware of the moon being out during the day but I have never questioned it before. The moon on Saturday was so bright though that it seemed to be an unusual occurrence; nearly everyone I met commented on it. When I started to think about it, it started to bug me even more. If the sun was out shouldn’t the moon be on the other side of the Earth? Isn’t that how it works? Surely, if it’s daytime here and night-time in Australia then the moon should be doing its thing over there. It seems impossible to me that we should be able to see the sun and the moon at the same time – after all, when the sun sets its gone. On doing some research though I have found that my reasoning is flawed. Apparently, the moon is NOT always visible during the night. 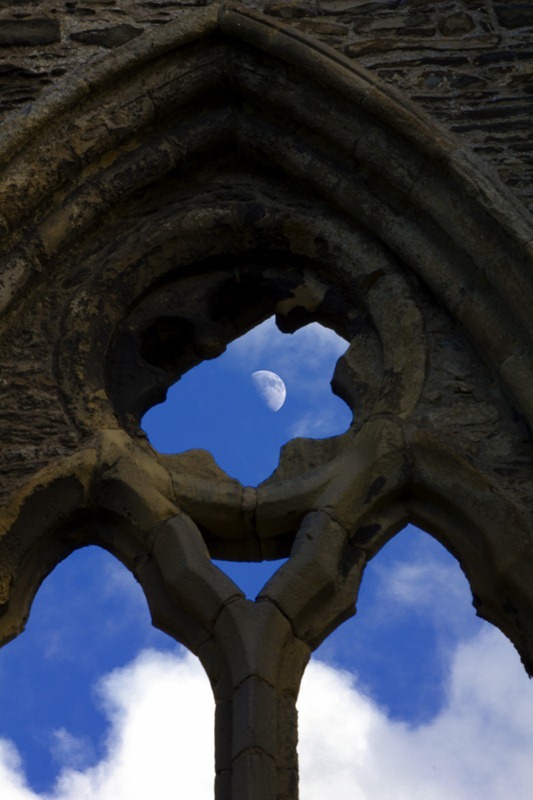 Depending on which position the moon is occupying in its lunar cycle (which lasts about a month as all good werewolves know), it may be visible during the day, or the night, or both. We puny mortals notice it more at night, purely because it contrasts much more brightly with the night sky. 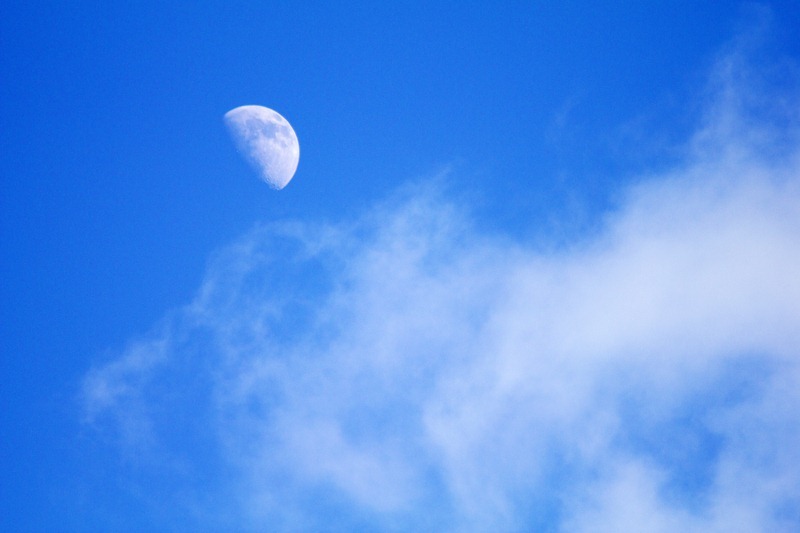 However, it seems that the moon is in the sky during the day just as much as it is in the night. Also, if we can see the moon in our sky (day or night), people on the other side of the world can’t see it (night or day). But why? Sometimes the moon is close to the sun forming a thin crescent. At these times, it therefore rises and sets pretty much at the same time as the sun and is visible in the sky all day (even if we don’t notice it) and not in the sky at night (Who knew that the moon is sometimes not in the sky at night – not this thicko!). On these occasions (i.e. when close to the sun and in its crescent form) the moon is hard to spot in the day. Other days, the moon is further from the sun, and may be on the opposite side of the sky. Now, the moon appears full or nearly full on account of its position relative to the earth and to the sun, the moon’s source of light. Since the moon is on the opposite side of the sky at these times, it rises in the east at more or less the same time that the sun is setting in the west. Therefore, when the moon is further away from the sun it stays out all night and sets in the west as the sun rises in the east. I’m still not sure I understand it that well. 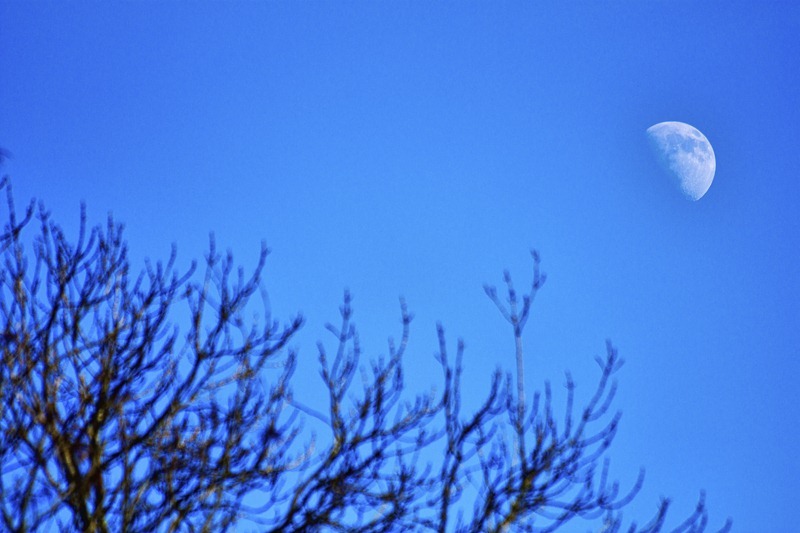 I assume though that the moon’s extrovert appearance on Saturday was a combination of being somewhere in the middle of these two cycles and the fact that the sun itself was so bright – the moon being the most reflective object in the sky. Anyway, as you can see here I took quite a few pictures on the moon on Saturday as it struck me as being very unusual, even though it apparently isn’t. 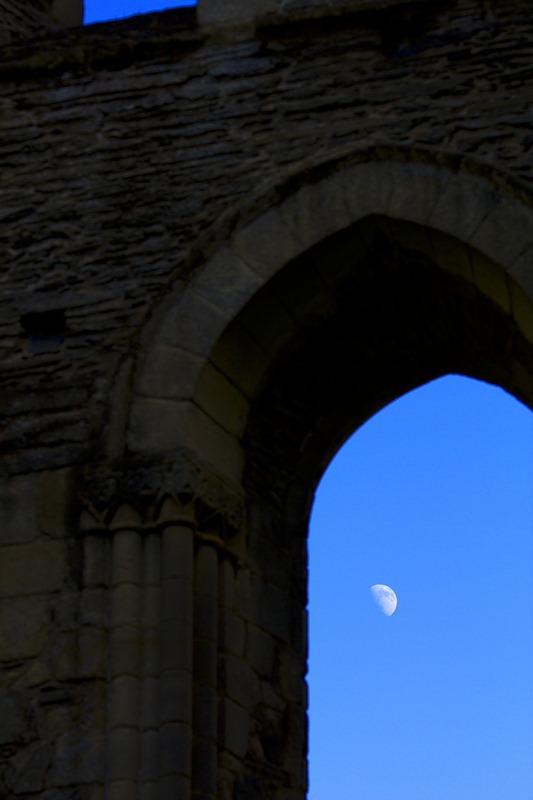 The picture that heads the blog was an attempt to get the moon framed in one of the windows of the abbey. I took several versions of this picture some with everything in focus (like this one) and some with the moon in focus and the window blurred. I think this works the best though. A few more pictures are below. Comments would be lovely, if only to pick holes in my lack of astronomical knowledge. I think Professor Brian Cox’s job is safe for now. By the way if you somehow missed his ‘Wonders of the Solar System’ TV series get it now; highly recommended. Watching it as a photographer though only serves to highlight all the wonderful places in the world I’ll never get to go; until that lottery win anyhow.